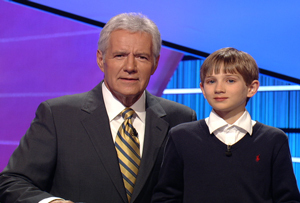 Thomas Horn, age 12, won a lot of money on Jeopardy and has now set his sights on Hollywood. 12-year old Thomas Horn won this year's Kids Week on Jeopardy, taking home a grand total of $31,800 in prize money. Not content with being a Jeopardy winner, Horn is looking to add "movie star" to his little kid resume. Director Stephen Daldry (Billy Elliot, The Reader) just cast Horn as the lead role in Extremely Loud and Incredibly Close, a film adaptation of Jonathan Safran Foer's novel of the same name. Horn will be playing Oskar Schell, a kid who loses his father in the terror attacks on the World Trade Center. Deadline describes the character as, "bright and precocious," so on the surface, at least, Horn seems to fit the bill. Extremely Loud and Incredibly Close follows Schell as he finds a key amongst his dead father's stuff, and sets out to see what it unlocks. Also starring in the film are Tom Hanks and Sandra Bullock. Way to rank among the Oscar winners on your first go, kid. Deadline also notes that Horn is signed to the same agency that represents other child actors such as Abigail Breslin (Little Miss Sunshine, Zombieland), Hailee Steinfeld (True Grit), and Kodi Smit-McPhee (Let Me In).